Today’s TVs have benefited from huge advances in engineering and manufacture, and they look amazing. But they only look amazing; in most cases, the sound they produce is as flat and as thin as the panel itself. 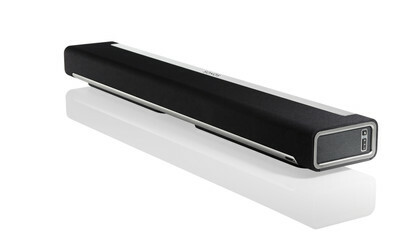 A soundbar such as this one – basically a long box with a handful of speakers inside it – is a neat, easy way to get better sound. 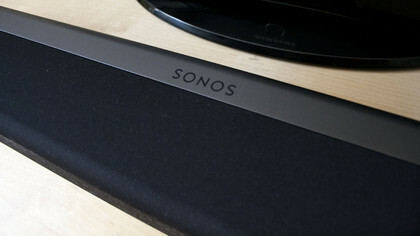 And in the case of the Sonos Playbar, by ‘better sound’, we mean bloody lovely sound. We’ll get to the setup and the technical stuff, and we’ll calm down a bit in a minute, but allow us a few paragraphs of gushing right at the top. You might not notice all that much difference if you just hook it up to your TV and tune into the news. Oh, yeah; that does sound a bit richer, I suppose, you say to yourself. But you didn’t spend six hundred quid just so you could make Bill Turnbull sound better (unless, perhaps, you are Bill Turnbull; hi, Bill!). So you stick some music on. And an hour later, once you look up again having sat mesmerised as you discover depth and delight in tracks you thought you knew well, you’ll know that that £599 was well spent. 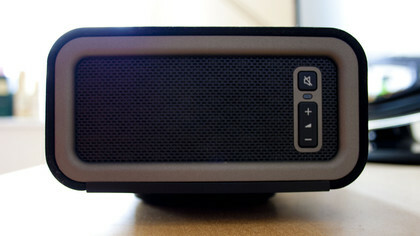 Sure, you might crave a bit more punch at the bottom end, something you could add with a Sonos Sub that would – eek! – double the cost of the Playbar. Yes, the stereo separation, while remarkably good for a single unit thanks to side-firing speakers, could be better. But we’re saying all this because we’re being all professional and objective; what we really want to do is to invite you into a room, play some of your favourite music through the Playbar and point at it, giggling in delight as you too fall in love with cherished artists and albums all over again. 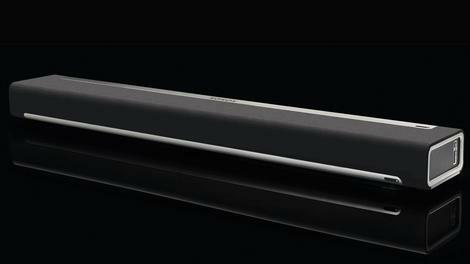 The best word we can use to describe the Playbar’s sound is ‘assured’; it’s not just that you never doubt that it will be able to reproduce that bassline, tricky percussion or soaring vocal that’s coming up, but that it does it all without strain or even apparent effort. There’s no sense that it’s trying too hard, no sense that Sonos is masking lack of control at the bottom end with silly, juvenile thumpiness. It just sounds clean, precise, neutral, without sliding clinical soullessness. A similar thing happens if you’re watching films or well-made television. You realise, especially if you’ve only ever used your TV’s built-in speakers, that there’s a glorious amount of depth, detail and delight in the soundscapes. Again, the difference if all you watch are speech-based programmes such as EastEnders or Question Time, is less marked; even then, though, you appreciate the fuller sound. You might, if you’re a big fan of action movies, feel that you’re not getting enough bang for your buck, almost literally, as that lack of Michael Bay oomph at the very low end might leave you a little underwhelmed; it’s not that it’s lacking bass, or that what’s there sounds bad or unimpressive, but rather that there’s not much of the almost visceral rumble you hear at the cinema. One is night mode, which crushes the dynamic range of the output – making loud sounds quieter and boosting soft sounds – depending on the volume, so as not to disturb neighbours or sleeping children. It works, too, as does the speech enhancement mode; you probably don’t want it turned on if you’re playing music, but it can do a good job of picking out speech that might otherwise be buried in the mix for TV programmes and movies. 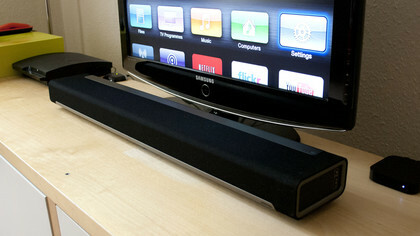 Based purely on the audio quality, then, we are a little bit in love with the Playbar. It is, we know, expensive, but it has a huge effect on everything you watch on your television, and it’s one of the best straight speakers you can put your music through. 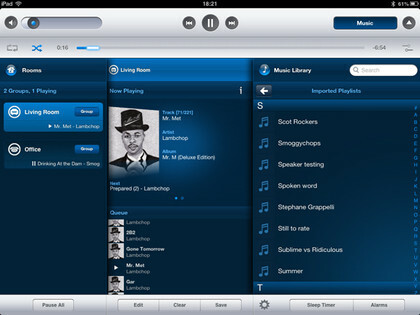 And that’s good because, since it’s made by Sonos, it can form part of a network of easy to set up speakers, and Sonos’s apps for iPhone, iPad, Android, Mac and PC can stream not just the devices’ own music or music stored elsewhere on your network, but also music from Spotify, Last.fm, Rdio, many thousands of internet radio stations and more, directly to the Playbar or other speakers connected through the Sonos network. 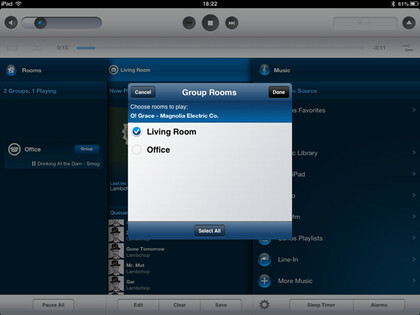 Once configured, you can use the controller app on any of the above devices to send audio to all the Sonos speakers throughout your house, and you can group them into zones and send audio to multiple speakers at once. 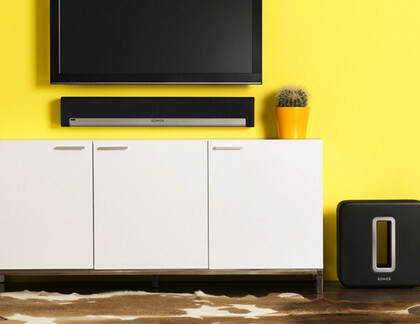 Sonos’s other speakers, the Play:3 and the Play:5, are well regarded, and the Playbar could well act as a gateway drug to slowly building a complete wireless multi-room audio system – and if you did, you’d be happy. If you have primarily Apple stuff – Macs, iPhones, iPads and iPod touches – you might prefer to buy into Apple’s AirPlay system, partly because it’s built right into the systems rather than needing to be controlled through the Sonos app, and partly because while with Sonos your choice for integrated speaker systems is limited to three models, with Apple’s licensed AirPlay system you can mix and match different speakers from different manufacturers that are tuned for different tasks. 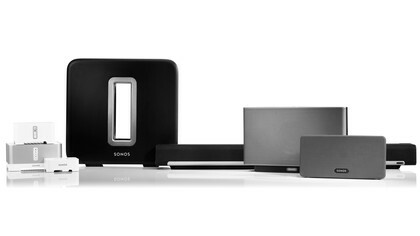 Sonos is a little more suited to power users than AirPlay currently, but in any case you can still happily use it with Apple kit. 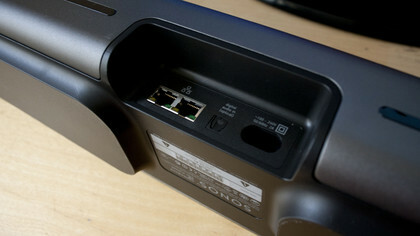 Connecting the Playbar to your home network for network audio, if this is your first Sonos speaker, either has to be done with a direct Ethernet connection to your router, or you have to buy the £39 Bridge and connect that wired to your router to allow the Playbar and other Sonos kit to connect wirelessly. Launch the controller, press a button, and everything’s configured. Happy days. Connecting it to your TV, though, it a little trickier. Well, it’s actually very easy, but there are caveats. 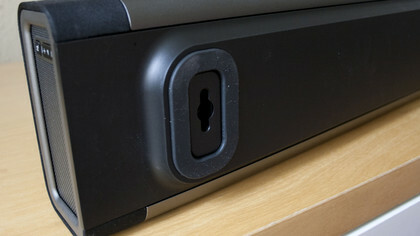 The Playbar has only one input, and it’s an optical in. The idea is that you mute your TV’s own speakers, connect all your consoles and other boxes to your TV using HDMI or whatever you like, and then run a single optical cable from the TV to the Playbar, removing the need for messy input switching on the speaker. The Playbar then learns what volume up, volume down and mute commands your TV remote sends out during the setup process, and listens out for those. You can probably spot the potential problems. You need a TV that not only has an optical audio out, but that also dutifully passes the audio from other inputs out through that digital connection. It also has to have the option of muting its internal speakers, otherwise you’ll get at best poorer sound quality as its less accomplished speakers vie with the Playbar, or at worst an irritating echo if there’s even the slightest delay between the two. While we applaud the cleverness of letting you use your own remote, we did sometimes wish it had a dedicated one, and it caused us to do a bit of wrestling with our Logitech Harmony remote; basically, when you add clever and clever, you sometimes get stupid. That would be the thick end of two grand, though, so it’s a big single investment. 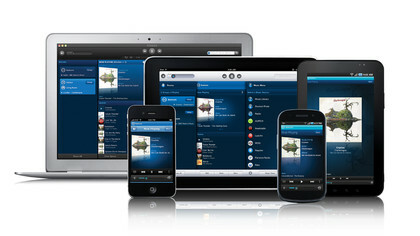 The beauty of the Sonos system, though, is that you don’t have to buy it all at once. Buy the Playbar. Add the Sub next year. Perhaps someone will buy you a Play:3 for you at Christmas, and so on. We like the Playbar enormously. It sounds stunning, can integrate nicely into an existing Sonos audio system, or be the first thing you add to your home from which a rich, easy to use multi-room audio system can organically grow. We’d be happy to use it as it is; there’s enough rumble in the bass to give action movies an appropriate sense of drama, but the mid-range and high-frequency audio is sweet and clean. If you decide you do want a more bombastic bass, you can always shell out the £599 for the Sub, but it would be a ‘nice to have’ rather than a must-have, and there’s the option of adding Play:3s for 5.1 surround. Sonically, the Playbar takes assuredness and accomplishment so far as to be almost dull, but we mean that in the most flattering way we can. It’s like an Audi, or like Jeeves. You never worry that it won’t be able to do the things you ask it to do. It’s not cheap, and there’s a part of us that just wanted it to have three or more HDMI inputs and a remote control in the box, but while we’re contractually obliged to return our review sample back to Sonos, there’s nothing that says we have to do it with good grace. Want.